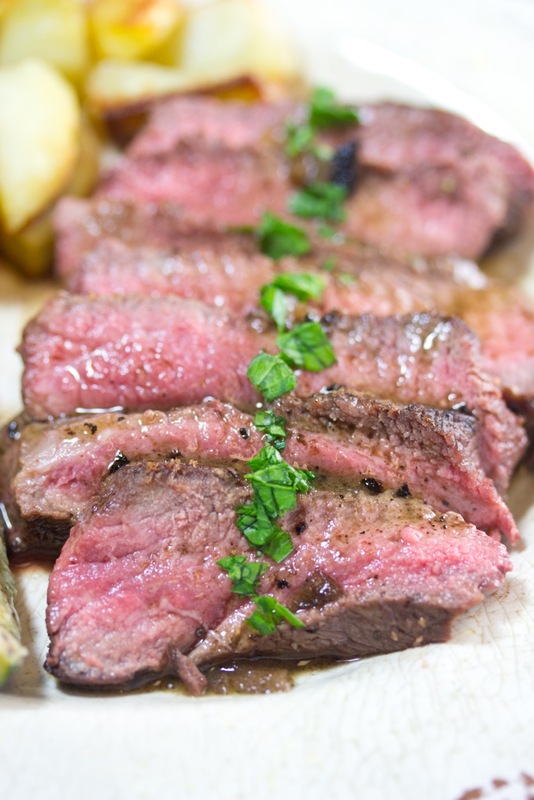 Learn how to make the juiciest tenderest steak ever! And you might not guess it from the pictures, but this dish is super quick to make too. You’ll start marinating your steak earlier in the day, and when it’s time to cook, it takes just 20 minutes, tops. This is one of my go-to gluten free and paleo meals. My teenage sons love it. Since they are working out, they are burning calories fast and have trouble putting on weight. Since steak is ruminant meat (cows get their nutrients from plant-based food), the meat has a high quality fat content. So, what’s the secret to a really tender and juicy flat iron steak? Marinate it for at least 4 hours and then quickly pan sear it. After pan searing the steak, you can take the flavor to the next level by accompanying the steak with a sauce made from the pan drippings. First, marinate your steaks for at least 4 hours before cooking. Take steaks out of the refrigerator an hour before you’re ready to cook, if you can, to bring them to room temperature. Pat the steaks dry with paper towels, discard the marinade, and pound the steaks with a meat tenderizer. Now, turn on your vent fan (the searing process can get a bit smokey). Heat oil in your skillet for a minute or two before adding the steak. I use refined avocado oil because it is very heat stable with one of the highest smoke points. This makes it one of the best possible oils for frying. It is also highly nutritious and loaded with antioxidants. Read all about its health benefits here. After about 4 minutes, flip the steak over. Cook for another 4 minutes. Now check the temperature with a meat thermometer. Lift the steak out of the skillet with tongs and insert the meat thermometer into the side of the steak. You may need another minute or two until the temperature reaches 140℉. Then the steak is done. Let your meat rest on a platter for 10 minutes before slicing. The temperature will rise a little as it rests. Slice the steak against the grain when you’re ready to serve. While the steak rests, you can make the sauce right in the same pan. Rich-tasting shallots, garlic, and wine in a beef broth topped off with creamy butter make this sauce irresistible. Season with a dash of salt and pepper and serve with your steak. This method is also excellent for a strip steak, rib-eye, or flank steak. Just adjust the timing depending on the thickness of your cut. If you don’t have time to marinate, you don’t have to. But marinating will help make the meat extra flavorful. It’s best to take steaks out of the refrigerator an hour before you’re ready to cook, if you can, to bring them to room temperature. Pat the steaks dry with paper towels and pound the steaks with a meat tenderizer. A few whacks with the mallet softens the fibers of the meat, and your steak will turn out nice and tender. When you’re ready to serve, thinly slice your steak against the grain. Voilà! A satisfying, juicy steak with a mouthwatering sauce. I served mine with roasted potatoes and baked zucchini sticks. If you’re following a low-carb way of eating, however, you may prefer serving yours with seasoned cauliflower rice with bacon or creamy cauliflower mash. Enjoy! And if you make this recipe, share your snap on Instagram and tag #glutenfreehomestead. I always love seeing your photos. For marinade: Mix wine, oil, garlic, dijon mustard and scallions in a shallow dish. Add steak, cover and marinate for at least 4 hours in the refrigerator. You can leave it to marinate for as long as 12 hours. Cook: Pat steaks dry with paper towels. Pound with a meat tenderizer. Season with salt and pepper on both sides. Now, heat oil in your skillet until it is very hot. Place steak on the pan for about 4 minutes. Now you can flip it. Cook for another 4 minutes. Check the temperature and continue cooking until the inside temperature reaches 140℉. (You may have to turn the heat down a bit and cook another 1- 2 minutes on each side). Let your meat rest for 5-10 minutes before slicing. Thinly slice steak against the grain. For sauce: Add one tablespoon of the oil to the same skillet and scrape up the brown bits from searing the steaks. Sauté the shallots until they've softened and turned golden, 2 to 3 minutes. Add 1/4 cup wine Reduce to about half by simmering for 3 minutes. Stir in broth and simmer to reduce again to about half. Whisk in 2 tablespoons of butter. Season with a dash of salt and pepper. Serve with your steak. It's best to take steaks out of the refrigerator an hour before you’re ready to cook, if you can, to bring them to room temperature. When you're ready to serve, thinly slice your steak against the grain. Barbara, I’m visiting from the UBC, which is also where I originally found your work and how I originally subscribed to you.. Your recipes are luscious, specific, and easy to make. I must find out if I can get this cut of beef around here. Arizona has a big beef industry, but cuts of beef seem to go in trends. Is there a second name or second cut of beef we could treat similarly? Thanks for all your great work and recipes! That looks absolutely delicious! I’m always looking for quick and easy recipes so I can get dinner quick after work. Definitely going to try this. Ladies, this looks awesome! I found you guys at A Little R & R Wednesdays. Thank you! So glad you took the time to stop by and leave this note. We get a quarter of organic grass fed beef from a local farmer every year. This recipe will come in handy when we get new steaks – its sounds and looks delicious. I always love a tender steak. Thanks for sharing on Real Food Fridays. Tweeted & pinned. Thanks for inviting me. I’ll stop by for sure. This looks amazing. 🙂 I’m awful at making steaks, so this will come in handy for me, for sure. 🙂 Thanks so much for sharing it at Savoring Saturdays! I’m going to try this. I always overcook this type of meat. Let’s see how it goes.